Mona Lisa is a famous painting by Leonardo Da Vinci. While, it is unsure who is woman in the painting, most experts claim it to be a portrait of Lisa Gherardini, the wife of Francesco del Giocondo. The painting is believed to be done between 1503 and 1506. 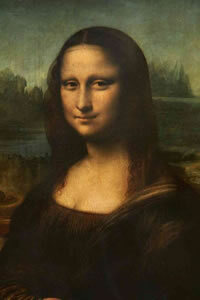 However, it is believed that Leonardo may have continued to work on it till 1517. The painting is oil on a white Lombardy poplar panel. It was originally bought by King Francis I of France. It is currently the property of the French Republic, and has been on permanent display at The Louvre museum in Paris since 1797.